Some of you know that I plan my sewing way ahead, but one area that I totally let slip is Christmas sewing. Usually it’s the week before when I think about making something and quickly talk myself out of it as being way too late to take on more of anything. As a Sewing Portfolios Ambassador I was given the opprotunity to receive some of the Nutcracker line from Michael Miller fabrics. With little Christmas sewing experience, I admit I didn’t know what I was going to do to show case them. My husband suggested I make pj bottoms for the whole family (not realizing he’d have to be in the pictures) and I ran with it. If you’ve sewn with quality quilting cottons before, than you know what to expect from Michael Miller; a high density thread count, soft hand, and easy to press and sew. The Ornaments and Mini Overature fabrics have a gold metalic print that I’m so impressed with. After sewing, pressing, and several washings the metalic is still looking great. After disappointing results with other metalic fabrics, this was a pleasant surprise. In making my little guy’s pants I made a rookie mistake, but the fix ended up making them even cuter. Here’s what happened. I pulled out my Maxi pants pattern, but forgot that I was using the pattern pieces for the knit with negative ease not the woven version. To fix the crazy small pair of pants I made, I inserted a side stripe in hopes at redeaming the project and to mimic the look of the toy solders printed on the fabric. I have a little bit of each fabric left over to make something else. I have my eye on making some numbered drawstring bags to count down the days to Christmas. Here’s hoping I don’t forget until the week before Christmas. Patterns: The little guy is wearing the Maxi pants from Zirestoff Patterns, hubby is in S1605 view D, I’m wearing the Comfy Cozy Pajama shorts from Laela Jeyne. This post may contain affiliate links, if you purchase through my links I get a small portion to help pay for my sewing hobby. Welcome to day three of the Show Your Stoff blog tour. We’re featuring Zierstoff Patterns throughout the tour. 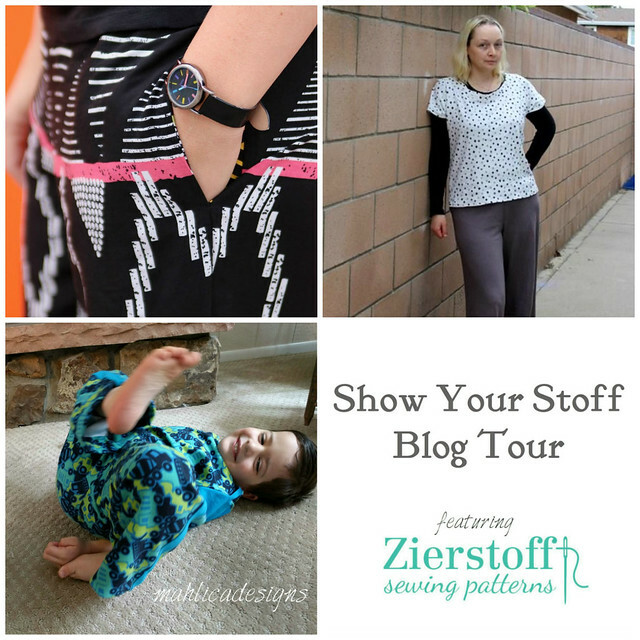 I’m one of several bloggers Showing My Stoff today, so please be sure to stop by and see what everyone has made and tell them what you think in their comments section. For my little guy, I’m drawn over and over again to patterns that have details built into them that I can colorblock or use contrasting colors with. The ELIAS tee and MAXI pants have both. I paired this truck print from my stash with some turquios cotton lycra from Simply by Ti to get the look. For my 4.5 year old who seems to be timing his growth spurts with me sewing him something new, I sized up to a 116 (5-6yr old) in the ELIAS and in the MAXIs. Now where is that growth spurt? I found I needed to trim down the neckline of the ELIAS tee by 1/2 (front and back) for the tee to lay smoothly around the neck. All else about the tee goes together very easily and I love the look of the envelope neckband. On the MAXI pants, I decided to do a hemed versus banded leg opening so I could extend the life of the MAXIs with a really deep hem that I can let out later. Without a contrasting band to break up the print, I added a turquois side stripe to do the job. This was extra fun as the little guy and I worked on his first try at sewing with me. I operated the foot pedal and helped him feed the fabric through the machine to topstitch along the stripes. He did really well and was so excited to show daddy. The practice scrap is still hanging on the art wall in his room. My little guy tends to think a knit top and bottom equals pajamas, and with the fact that the top and bottom are so matchy matchy he may just end up being right about that. So is his new outfit destined for casual day wear or bedtime coolness? Time will tell. 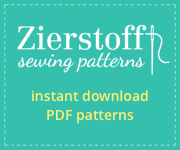 Want to Show Your Stoff too, use code MahlicaDesigns30 to save 30% off Zierstoff Patterns during the month of April. The lightning tee was an easy pick for me because the lightning shape is so graphic and gives a superhero look; and there are all kinds of color blocking options in this shirt. The puppy heros fabric in my stash was just right to play off the graphic shape. I’m so pleased with how it came out and can see using this pattern over and over again. At first I was a little concerned that I picked a tough pattern with all those angles to sew in, but the bodice pieces are layered over each other and topstitched together instead. So easy. To make sure I lined things up evenly, I used my chalk marker to mark the 1/2in seam allowance on one side and then lined up the raw edge of the other piece along the chalk line to get a perfect 1/2in overlap. I did just fine pinning and sewing along the topstitching lines of this seam, but I could see how something like Wonder Tape would work great here too. I made a size 5/6 for my almost 5 year old and he has plenty of growing room as planned. The hardest part of this pattern was picking out which colors to use where. I have my eye on the Hemlock tee for boys too- another a colorblock tee with a nice buttoned shoulder and side split at the hem. The Fabric: I paired my stashed print with a turquoise cotton lycra from Simply by Ti*. The cotton lycra from Simply by Ti worked perfectly for this project; it has good recovery, doesn’t curl up after being cut, and was easy to sew. The front piece is topstitched together along the lightning zigzag and there was no problem with stretching or rippling of the cotton lycra. I had 1in of shrinkage in my one yard cut after washing cold drying low/med heat. There was some edge curling after washing but I find that to be normal. 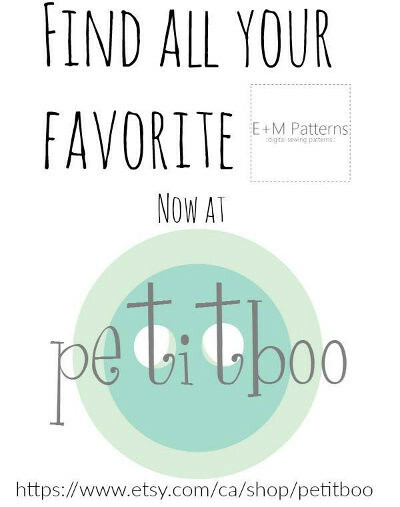 I have a discount code for you from Petitboo etsy shop! Use code: petitboo50 for 50% off in the etsy store. Good from Monday (March 6th) 12:00 am to Friday 11:59 pm (March 10th). Petitboo Patterns provided me a complimentary copy of the Lightning Tee pattern to use in the Petitboo Blog Tour. Simply by Ti provided me a sample of her cotton lycra in exchange for a review. These are my honest observations of the fabric. It’s that time of year where Christmas sewing takes over and the to do lists pile high. I’m not into stressing myself out in that way, so I keep my Christmas sewing easy with just one obligation; Christmas Eve pajamas for my little guy. Flannel pjs using the Pajama Rama pattern from ShwinandShwin have been my standard, but I’ve mixed things up a bit by sewing a new pattern; the Dreamtime Jammies from Blank Slate Patterns. The Fabric: Superhero Pups Interlock from Joann.com. I like that this knit is a little thicker for winter and has enough stretch to easily use for the cuffs and neckband on the pattern. The Dreamtime Jammies should take you about 2 hours to make. I used about 1 yard at 60in wide.